If you think you might be pregnant, you need to know right away. With Clearblue Rapid Detection Pregnancy Test, a 'Pregnant' (+) result may appear in one minute when testing from the day of your missed period. 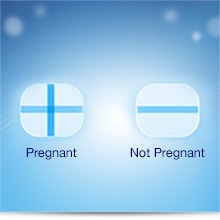 You should wait three minutes to confirm a 'Not Pregnant' (-) result. Clearblue Rapid Detection Pregnancy Test is also designed to be the easiest to use with an ergonomic curved handle, wide colour-changing tip for easy sampling and clear + or - results. Over 99% accurate from the day of your expected period, giving you a clear and accurate result when you need it most. A pregnant result may appear in as little as one minute when testing from the day of your missed period. Wait three minutes to confirm a not pregnant result. The tip turns pink to let you know you've hit the target. The Clearblue Floodguard Technology helps reduce the number one cause of reported user error by over 70%*. To test, either place the absorbent tip directly in your urine stream or in a collected sample of your urine for five seconds. If testing from your missed period, a pregnant result may appear in one minute (wait three minutes to confirm a not pregnant result). The tip instantly changes colour from white to pink to show you have hit the target. Simply replace the cap and wait for your result. *Vs. our standard visual test. Based on calls to helpline throughout 2010 and 2014. **'Missed period' refers to the day after you expect your period. 79% of pregnant samples can be detected six days before. 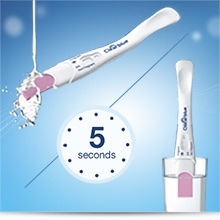 Clearblue Rapid Detection Pregnancy Test can give results as fast as 1 minute. 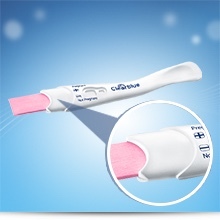 Clearblue Rapid Detection Pregnancy Test. You should wait 3 minutes to confirm a ‘Not Pregnant’ result. 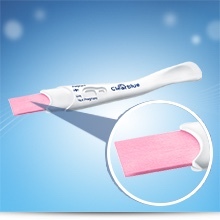 It is designed to be the easiest to use home pregnancy test. It has wide, colour-changing tip and ergonomic shaped handle. In a UK study, over 9 in 10 women said they would pay more for Clearblue Rapid Detection. Compared to a strip test (based on 111 women using and reading different test types). For information on this product or answers to your questions, our Careline advisors are available. From 4pm – 12 midnight Winter, 6pm – 2am Summer, AET. • World's No. 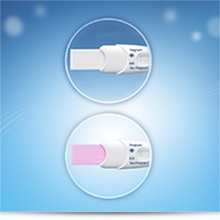 1 selling Brand (In home pregnancy & fertility tests. Based on international sales in nearly 20 countries compiled using independent market research data). This device is for home use. Keep out of the reach of children. Please read enclosed instructions carefully before use. Clearblue is a trade mark of SPD Swiss Precision Diagnostics GmbH ('SPD'). Copyright © 2017 SPD. All rights reserved. Clearblue Pregnancy Visual Test 1 Pack is rated 5.0 out of 5 by 1. Rated 5 out of 5 by Kedition from Great features This product is amazing, it works great. Clear blue always comes out strong with these pregnancy tests.